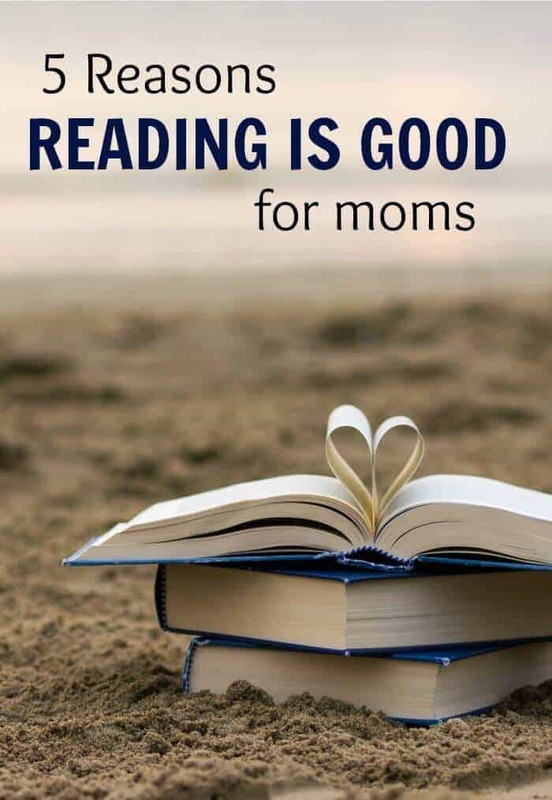 In your previous (non-mom) life, did you love reading? Well even though life is busy now, I believe time for reading can still be found, and think it’s a far better way to spend our time than some other things. I have been a reader since childhood. From Sweet Valley High and the Babysitter’s Club to R.L. Stein . I read in the car, at home, and outside. I continued reading throughout my youth and into my 20’s… and then I had kids. Then the books on my nightstand were parenting books. And then I grew sick of self-help. It wasn’t until recently that I knew I needed to get back into reading because, see, my husband and I made a no technology rule after 8:00-ish p.m. If you’re used to having screen time in the evenings, it’s actually quite difficult to figure out how to fill your time at first. Now we’ll usually do projects, talk, go for a swim, and read. I’ve gotten back in the habit and I feel so much more refreshed and balanced than before. 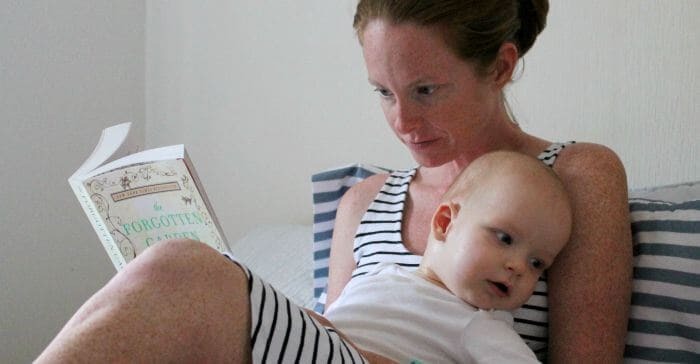 Here’s why I think reading is good for moms. Lying on the couch, in your bed, or a favorite chair with a book is a cozy thing to do. Your body relaxes, your mind focuses on the story, and you lose yourself in the book. Whereas a self-help book keeps you comparing and contrasting your own life with the story (not a bad thing in and of itself), you can lose yourself in a novel and sometimes that’s exactly what’s needed. Particularly if you are a tired mom or in a day to day stressful situation. 2. You can do it anywhere. What I love about reading is that it is mobile. While I like sewing and DIY projects, you can’t do them in the waiting room at the doctor’s office. You can read a book in a waiting room, during the school pick up line, and obviously at home. While at home I actually prefer to eat in bed for some reason. I think it helps me wind down. If I had a nice special chair and blanket I might change my mind, but for now I’m a bed reader. 3. It takes us out of our bubble. When we’re in the thick of parenting (surviving the newborn phase or going through a difficult time with our toddlers) we often stay inside our own world. It becomes all about the kids. Teething, diaper rash, reading books, and making sure everyone is alive. Sometimes reading books helps remind me that this phase is difficult, but it’s amazing. You can even join books clubs, virtual or in person, and use it as a weekly reprieve from the duties and tasks set out in your stay at home mom resume. 4. It’s a relatively inexpensive hobby. 5. It keeps you off of social media. Now, of course social media isn’t the devil or anything. As a blogger I use social media often, but probably because of that… I feel very imbalanced if I spend too much time on Facebook, Instagram or Pinterest. I start feeling like I should do this or that. Or I realize I’m not trendy, but forget I don’t actually want to be trendy. I pin two thousand projects that the mentally transfer to my “to do” list since I’m a Type A mom and anything I see becomes something that is a possibility. Reading takes you away from screens, away from comparison, and away from any feelings of “should” or “need to.” You actually stop thinking about yourself, period. So here are those on my list. Some of these I have read and love and others are on my TBR list (which I recently found out is the “to be read” list). Oh, and before we get started, I came across this free printable book journal where you can record the books you want to read, write the ones you have, write those you’ve abandoned (good way to find closure with a book you didn’t want to read, but don’t like to not finish something), and with a big list of book recommendations. I love Agatha Christie. When I was pregnant with my first, I lived in Scotland in a cottage that had hundreds of books, and I read as many AC novels as I could find. My favorites are below. I went through a phase in my early 20’s where I was mystery addicted and I find the old mysteries by AC and Arthur Conan Doyle to be more plot based and less gruesome with nothing very explicit. 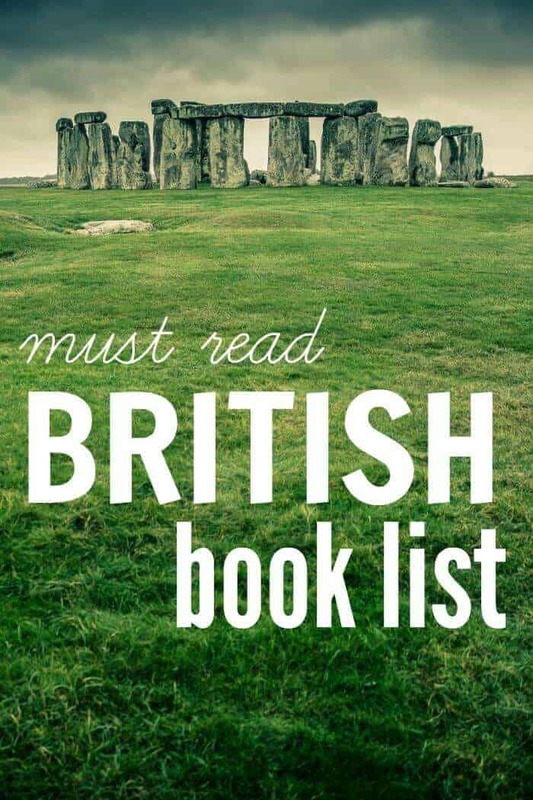 I have read every Jane Austen book, I do believe, and quite a few of them multiple times. They’re funny, easy, and actually very rich with profound character references.